The first step in sculpting a figure generally involves the creation of a clay "rough," or a preliminary sculpting modeled out of an oil-based clay. The sculptor places the clay over a wire armature, which gives the piece some internal stability. Then, a silicone mold of the figure is created, from which wax copies are made. The wax is then refined and imbued with its fine details, and a second silicone mold is made, from which 4-up hardcopies are generated. In short, the clay sculpting serves as a 3-d sketch of the final figure, which is capable of serving as the basis for the more refined wax sculpting that will become the master for mass production. 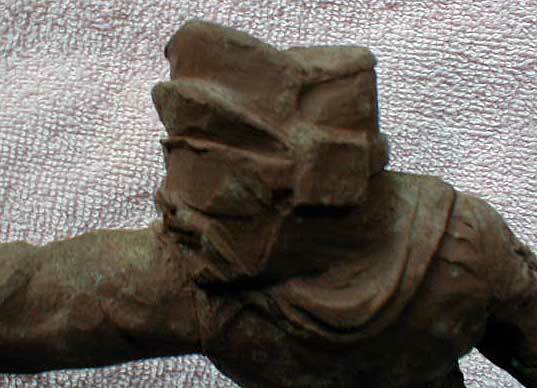 The first image shows a full side view of the figure. Although it resembles several produced Micro Collection figures, a figure looking exactly like this was never issued by Kenner. 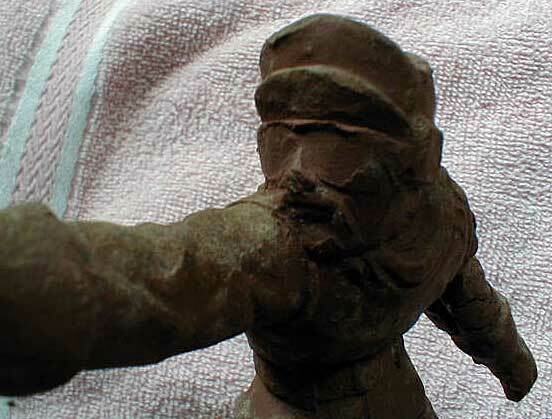 This is because this particular piece, while it represents what a clay rough would look like, did not have a true part in any Micro figure's development. Rather, it was created by a prospective Kenner sculptor as a test of his sculpting ability. Nevertheless, it adaquately represents this early stage of figure development. 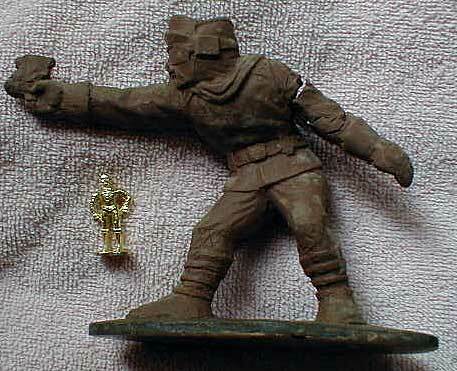 Virtually no clay roughs have survived for either Micro or 33/4" figures, so this will have to suffice for now. A close-up profile shot, showing some of the generalized detail sculpted into the piece. 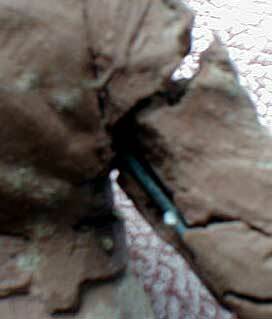 Lastly, this blurry image, which shows a break in the clay, displays the wire armature imbedded in the center of the figure. Unfortunately, oil-based clay doesn't last forever; eventually, it dries out and begins to crumble.